David Schmoeller’s 1979 movie Tourist Trap is a particularly effective horror movie–particularly due to the score by Charles Band, speaking of whom doesn’t get nearly enough credit for his composing, which here is at times playful, harrowing and cinematic–that unfortunately is showing its age. The movie revolves around a tourist attraction, Slaussens Lost Oasis, where Mr. Slaussen (Chuck Connors) owns a museum that showcases the mannikins that are the work of his brother, who’s more than little bit insane. Slaussen tries to keep his brother hidden–in a way very similar to Hitchcock’s Psycho–but his brother refuses to stay put, preferring to escape from the house he’s held in to lure tourists to their deaths. The premise of this movie is awesome, and doesn’t actually need that much in the way of tinkering story-wise, other than to bring the special effects more in line with modern sensibilities and technologies. It’s also worth mentioning that, Besides Psycho, the movie also has more than a passing similarity to Brian DePalma’s Carrie, (which came out three years earlier) yet despite this it somehow manages to be not only original, but its own animal. It goes without saying that effects need to be practical because it would work best when there’s actually something that actors are acting against (which is typically the case, though there are some instances when it CGI is perhaps a better fit, though not in this movie). Another thing with mentioning is that what makes Tourist Trap as effective as it is is that the acting (particularly by Jocelyn Jones as Molly and Connors that elevates the material beyond many better known examples of the horror genre). 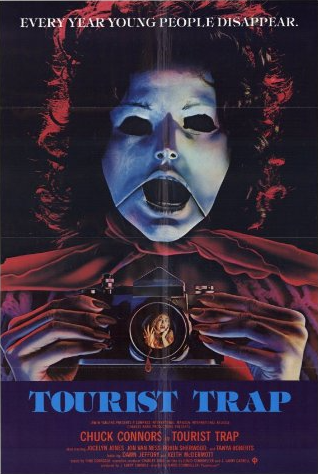 In fact, I suspect that the writers of the 2012 remake of Maniac (Alexandre Aja and Grégory Levasseur) must have at least heard of Tourist Trap because it plays very similar, especially in its third act. Posted in actors, directors, horror, The Unnecessary Remake Dept..Tagged @AlexandreAja, Alexandre Aja, Alfred Hitchcock, Brian DePalma, Charles Band, Chuck Connors, David Schmoeller, Franck Khalfoun, Gregory Levasseur, Jocelyn Jones, Psycho.